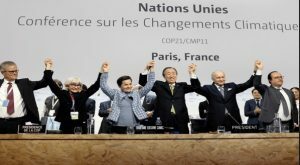 The climate deal, under the auspices of the United Nations Framework Convention on Climate Change (UNFCCC), was reached in Paris in December 2015. The Paris Accord took effect on 4 November 2016 and all 195 countries that participated in the talks, including the US under Obama, have signed it and made commitments to reduce greenhouse gases (GHGs). While there are no legally binding targets set by the terms of the Accord, as there were in the Kyoto Protocol, it was recognized that the “commitments” are real and countries intended to abide by them. They are promises. Moreover, the process included a provision that every five years there is a mandatory review process with the expectations that each country will attempt to increase its commitment since climate change increasingly presents significant risks and the original commitments in 2016 will not suffice to keep climate temperatures from rising beyond any reasonable limit. More is needed, not less, as time goes by. Unfortunately, the legal and political implications of the Accord are meaningless to Trump. It is clear that Trump had no intention of doing anything to help reduce GHGs, whether he stayed with the Accord or rejected it. Everybody knows that. So today, June 1, 2017, he announced he is withdrawing from the Paris Accord. If Trump stayed with the Accord, it is most likely he would have done so only under the pretext that he was going to re-negotiate a BETTER DEAL for AMERICA. Or he would have stayed and simply spit in the face of the Accord by openly ignoring the US commitment. In any case, it is clear that Trump does not and will not accept the premises on which the Accord is founded. Haven’t we had enough of him? 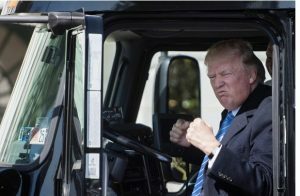 If he chose to stay, the options for retaliation for his essential rejection of the Accord’s purpose and goal were limited. If some countries, despite their best on-going efforts to comply with their commitments were unable to do so, the other signatories would be reluctant to take any punitive action, even name-and-shame, against them. At that point the US could have argued it could not be singled out for not meeting its commitment. A clean break by Trump, or with Trump, offers some advantages for global climate change progress. It will be more honest and a clearer battle line now that he has exited the Accord. At least the other signatories to the Accord, including the EU, China and India and developing countries, can consider counter-actions against the Trump-led US. These might include trade sanctions, including a carbon tax on US exports, always a risky business, but it might also free the others to imagine and implement other punitive sanctions. And it is likely that the remaining signatories to the Accord will proceed with their commitments, as technologic developments, especially with renewable energy sources and distribution systems, will have a major impact on the extent to which the Paris Accord commitments become realized. It would seem to be in the self-interest of China and India, regardless of what the US does not do, to move to renewable energy just to save its citizens from the toxic air impacts of burning fossil fuels. So let Trump suffer whatever consequences the remaining signatories can devise for his withdrawal. As for any demand for a renegotiation of the Paris DEAL, that demand should be immediately rejected out of hand. The EU is quickly learning how to do without Britain. Time for the international community to learn how to deal without Donald Trump. David Roberts, “ Bannon is pulling one over on Trump. There is zero reason to exit the Paris climate accord,” Vox (8 May 2017). Natasha Geiling, “America’s tragic fall from international climate leader to global embarrassment,” Think Progress (12 May 2017). EDITOR’S NOTE: An earlier version of this ieBLOG appeared on the morning of June 1st before Trump made his announcement of withdrawing from the Paris Accord. This version reflects that decision made at 3pm June 1st, NY time.